A High Elf in the Imperial City must be removed from existence. Talk to Ocheeva and receive the contract. Travel to the Imperial City. Find out where Faelian lives, then ask around there to figure out his story. Kill Faelian, and return to Ocheeva for the rewards. The mini-quest "My Brother's Keeper" instructs you to speak with Ocheeva to receive your next contract. She wants you to find and kill a High Elf named Faelian, somewhere in the Imperial City. She suggests speaking to your fellow Brothers and Sisters for advice. She also warns you not to arouse suspicions with Adamus Phillida, an Imperial Guard Captain and sworn enemy of the Brotherhood and says you must do this killing in a secure indoor location with no witnesses to receive your bonus. Vicente Valtieri will reveal that the Elves of the Imperial City are a rather close-knit community and that at least one of them will know Faelian, so travel to the Imperial City and speak with any Elf with a disposition of 50 or more about Faelian to learn that he lives at the Tiber Septim Hotel, in the Talos Plaza District. Speak with Augusta Calidia at the Tiber Septim to learn that Faelian was once a wealthy nobleman, but he's squandered his fortune on skooma. His wealthy girlfriend Atraena lives at the hotel as well and he visits her at night, perhaps she has more information. If you run into Faelian inside the hotel and speak with him, he will think that you are a fellow addict and will ask you to meet him later, outside the hotel. The hotel is a very public place; killing Faelian inside the hotel means you won't get your bonus for the contract. If Atraena's disposition is above 50, she will tell you that Faelian visits Lorkmir's house in the Elven Gardens District during the day to enjoy his skooma because the house is abandoned. In fact, he heads for the house at 11am and stays there until 5pm. Go to the house during that time, pick the lock, or steal the key from Faelian, and kill him in any way you see fit. If you search the basement you'll find Lorkmir's dead body, apparently killed by Faelian, which explains why the house is abandoned. 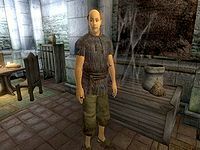 Talk to Faelian outside of the hotel and you'll quickly see that he is under the influence of skooma. After listening to his rantings ask him about skooma and he will get even more excited. If you happen to have some already you can offer it to him then and there. Otherwise, he will tell you about his supplier, Nordinor in Bravil; other places where skooma can be obtained are listed on the skooma article. Any source of skooma will be acceptable to Faelian. It is also possible to pickpocket it from Faelian himself, as he doesn't care. Once you have obtained one bottle of skooma, return to Faelian. In return for the skooma he'll give you the key to Lorkmir's house. Use the key to get in, wait for Faelian to arrive and kill him. Either way, return to Ocheeva for a level dependent gold reward (up to 600 gold) and a single Infamy point. If you were not detected, you will receive Shadowhunt as a bonus: a leveled bow with Damage Health and Damage Magicka enchantments. If you failed to properly complete The Assassinated Man quest, Ocheeva will now promote you to the rank of Eliminator and give you the Sanctuary Well Key. If you don't want to do all this detective work, just be at Lorkmir's house at some time between 11am and 5pm. He will arrive no matter how the quest develops. Nordinor will still sell you skooma whether you've already killed Faelian or not, provided you meet him after midnight in the alley. Faelian never eats and so cannot be killed with a Poisoned Apple. An achievement will be unlocked upon completing this quest if you failed The Assassinated Man. 20 Vicente Valtieri has no more contracts for me. Instead, I must speak with Ocheeva here in the Sanctuary. She will provide my new assignments. 100 Finishes quest Ocheeva has given me a new contract. 10 I must go to the Imperial City, find a High Elf named Faelian, and kill him. If there are any witnesses to the killing, or if I kill him in any non-secure location, my reward will be greatly reduced. 15 I must go to the Imperial City, find a High Elf named Faelian, and kill him. If there are any witnesses to the killing, or if I eliminate him in any non-secure location, my reward will be greatly reduced. I should start my search by asking any Elves in the Imperial City if they've ever heard of Faelian. 16 Faelian lives at the Tiber Septim Hotel, in the Talos Plaza District of the Imperial City. I should ask around for him there. I can feel myself getting closer. But I must remember, I will forfeit my bonus if Faelian is killed in an unsecure location. The hotel simply will not do. 17 Faelian lives at the Tiber Septim Hotel, in the Talos Plaza District of the Imperial City. I should ask the publican, Augustus Calidia, if she has any information. I can feel myself getting closer. But I must remember, I will forfeit my bonus if Faelian is killed in an unsecure location. The hotel simply will not do. 18 Faelian was once a wealthy nobleman, but has squandered his fortune away on skooma. Faelian spends most of his time wandering the city looking for the drug, leaving his sweetheart Atraena at the Tiber Septim Hotel. Maybe Atraena has some more information. What I know for certain is that Faelian is very close to death, but I must not kill him in the hotel if I wish to get my bonus. 19 Faelian is alone every day for several hours at Lorkmir's House, in the Elven Gardens District of the Imperial City. I could kill him there to avoid any witnesses. 25 I have supllied [sic] Lorkmir [sic] with skooma, and gained some valuable information in return. Every day, from 11:00 in the morning until 5:00 at night, Faelian goes to Lorkmir's House, in the Elven Gardens District of the Imperial City. The house is deserted, so Faelian goes there to use his skooma. I could kill him there to avoid any witnesses. And, conveniently enough, he's even given me a key. 30 Faelian has been killed, but not in a secure location, so my reward will be reduced. I must now return to the Sanctuary and speak with Ocheeva to receive my reward. 40 Faelian is dead. I killed him in Lorkmir's House, a secure location with no witnesses. I must now return to the Sanctuary and speak with Ocheeva and receive my reward and bonus. 100 Finishes quest I have returned to the Sanctuary and spoken with Ocheeva. It is possible to use the console to advance through the quest by entering setstage Dark06Wanderer stage, where stage is the number of the stage you wish to complete. It is not possible to un-complete (i.e. go back) quest stages. See SetStage for more information. Esta página foi modificada pela última vez à(s) 21h16min de 13 de dezembro de 2013.